You’ll need to spend the night in Nazinga Park. You can book ahead of time, but it’s possible to just show up and get a room. Accommodation is quite rustic, so ensure you pack lots of water. You’ll need to arrange your own vehicle (preferably with driver) to take you to the park. One of the park rangers will accompany you on your game drive. Make sure there’s enough room in the vehicle for your guide to sit in the front seat. Before leaving, ensure your driver knows the way to your chosen accommodation inside the park. January to April is the best time of year for animal spotting in Nazinga. In February/March is when the buildings in Tiebele are typically repainted. April would be the ideal month, but you’ll likely spot animals anytime of year, and the buildings are still impressive even if the paint isn’t fresh! 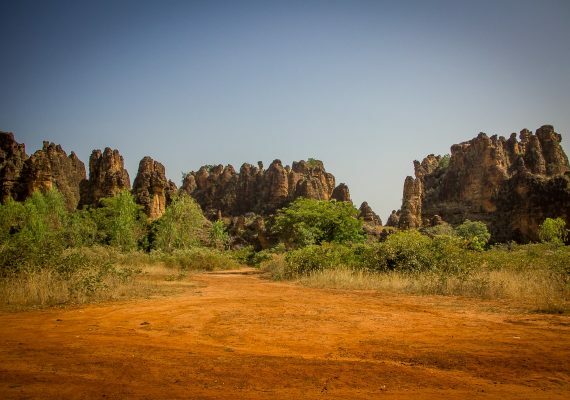 This overnight trip from Ouagadougou combines some of the best nature and culture that Tiebele, Burkina Faso has to offer for families. The nature is found in Parc de Nazinga, where you and the kids have the opportunity to search for elephants and antelope without anyone else in sight. Once you spot an elephant, or a few, leave the park and head north to Tiebele Village. The custom here is to decorate the mud houses with beautiful geometric designs in black and red. It's quite a contrast to the greenery of the Réserve de Nazinga and will give you an appreciation of the diversity of this beautiful country. 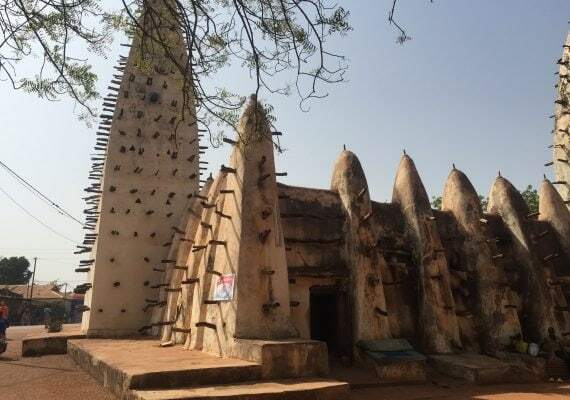 If you still have energy upon returning to Ouagadougou, finish off your cultural immersion with a visit to the Artisanal Village. The craftsmanship is quite good and the prices are set, so you won't have to use any more energy haggling over price. The Réserve de Nazinga is the place to go in West Africa to spot elephants. The grass is tall, but this adds to the experience. As you drive through the tall grass, you crane your neck to see if you can spot anything, and all of a sudden you’ll happen upon a clearing and an elephant, antelope, crocodile or warthog will be in your path. The concentration of animals is minimal compared to East or South Africa, but the concentration of tourists is proportionately less. There’s a good chance you won’t see another tourist on your entire visit. We visited Réserve de Nazinga specifically in search of elephants, and it delivered. Toward the end of our first drive we came upon a small waterhole. Directly across the water was an entire herd of elephants, everything from babies to the old matriarch. It was truly an incredible experience until our guide shooed us away from the water’s edge, in case there were crocodiles lurking beneath! DIRECTIONS You’ll need to hire a private car and driver from Ouagadougou to make the three-hour drive south to the reserve. I recommend you stay at the Ranch de Nazinga in the centre of the park. It’s not fancy (at all), but the location is ideal and you’ll be right in the middle of the park when beginning your game drive in the morning. Plus, if you decide to arrive early enough the day before, you can squeeze in an extra drive upon arrival. TIP Keep your kids away from the water’s edge because you don’t know what could be hiding below. 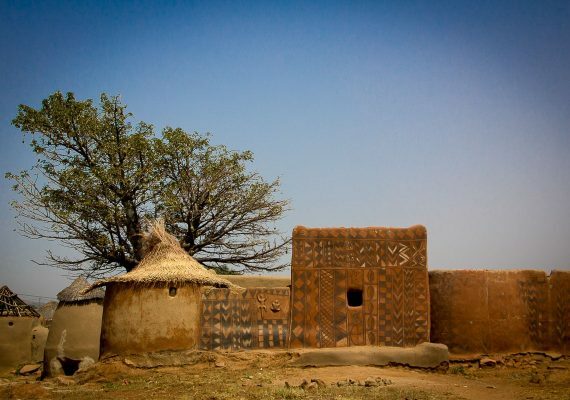 Tiebele Village has a large royal compound decorated with beautiful geometric designs. The compound is falling into disrepair and sadly isn’t as spectacular as it once was. Still, there are many houses that have the red and black geometric patterns, and the people are happy to show you around. The guides are very knowledgeable and will describe the meanings of the different styles of houses and pattern designs. You can visit the inside of a few of the houses and wander up to the rooftops for an overhead view of the complex. Daily life still happens around you and, if you’re lucky, you can see dinner being prepared or millet beer simmering on a fire outside. Just steer clear of the houses with a swirl pattern on the outside, it means there's a snake inside! DIRECTIONS Form the Réserve de Nazinga drive north to Po, and then it’s the third right onto the road to Tiebele. The road veers northeast for ways before turning south toward Tiebele. The village is 40 km (25 miles) from Po, down a decently well-maintained dirt road. TIP It’s a requirement to have a guide to walk around the royal court, but they’ll come find you. So few tourists pass through here that as soon as you enter town, word will spread and by the time your vehicle arrives at the compound a guide will be there to meet you. The Artisanal Village in Ouaga is a great place to wander and explore some of the artisan culture of Burkina Faso. It’s also the easiest place to buy souvenirs in Ouagadougou. The prices may be slightly higher than you could find elsewhere, but the prices are set so it’s much faster and less stressful, unless, of course, you like the thrill of the haggle. Even if you’re not buying souvenirs, it’s still fun to wander and check out the different crafts, jewelry and clothing. If you’re lucky, you’ll catch a few of the artisans at work. Our favourite part was hunting for the perfect African drum to bring home. DIRECTIONS From Po enter Ouagadougou on road N5. Turn right (east) onto the ring road, Boulevard des Tensoba, and the Artisanal Village will be a few minutes ahead on the left. It’s quite easy to spot from the highway and your driver should easily know the location. TIP It’s a large complex, so if you get thirsty head to the small canteen in the centre for a cold drink. If you do love the thrill of the haggle, bring a large purse. Many of the artisans will be willing to sell you an item for cheaper than the posted price with "no receipt" as long as you put it in your purse so it’s not checked on the way out the door. WE LOVEDThe complex is right on the edge of a large watering hole where many animals come to drink early in the morning. There are also monkeys nearby that visit the dining room! WE DIDN'T LIKEIt’s quite rustic, with concrete floors, basic bedding with mosquito nets, and lacklustre bathrooms. The electricity is only on for a few hours in the evening, and again for a few hours in the morning. TIPBring your own toilet paper and plenty of water.